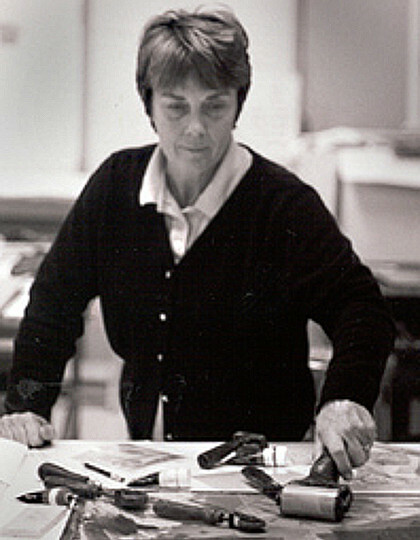 Linda, an L.A. artist and Professor of Art at Occidental College, is known for her printmaking, multicolored abstract monotypes and mixed media work. Linda’s work explores two distinct artistic directions; one which investigates the intuitive process of abstraction and the other which references the destructive beauty in nature. Her prints, Drone Warfare, Kent State 1970, L.A. Burning, L.A. Fragmentation, Burial Find, Found at Sea, Shipwreck, Macondo Blowout, Arroyo Vista, and several others are featured in the Springwood Poetry and Art Gallery. My work represents an ongoing intuitive response to printmaking media as well as a search for the sublime. As a woman printmaker, I’m drawn to the historical struggle of people who live and create artifacts from nature, specifically the Beothuk Natives of Newfoundland and the Native American basket makers of the West. As an environmentalist and Angelina, I’m inspired by the skyline and vistas that surround me. As a woman artist, I am drawn to the sacred symbols of life and the infinite. By using intense color, energetic gesture, and the printmaking process, I discover meaning through the act of doing, of making images that reveal themselves over time. Recently, I have combined different printing, painting, and drawing systems to transcend the limitations of one over another and express the interconnected relationship of all three. My working method usually begins with a monotype to establish a field upon which the image will evolve. By adding layers of transparent ink and paint through successive printings, each printing event is recorded, altered and ultimately transformed in the process.